Would you like to have FUN and ADVENTURE traveling with us to the most cosmopolitan cities of the Middle East? We were there last year in March. We loved it!! We are co-organizing this trip with Istanbul and Beirut Internations Groups. Beirut is the coolest city in that region, but indeed a city of contrasts. Possessed of some of the friendliest locals on the planet, it was also the scene of one of the Middle East's deadliest conflicts. While you will find beautifully restored colonial relics and old mosques delicate looking minarets Downtown, venture towards what was once the Green Line and you'll find buildings still peppered with bullet holes and missing chunks of masonry. 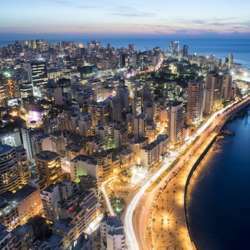 Nevertheless, while Beirut might have suffered more than most, it remains one of the most vibrant cities in the Middle East, and one of the most beautiful! You need to make your own travel arrangements.